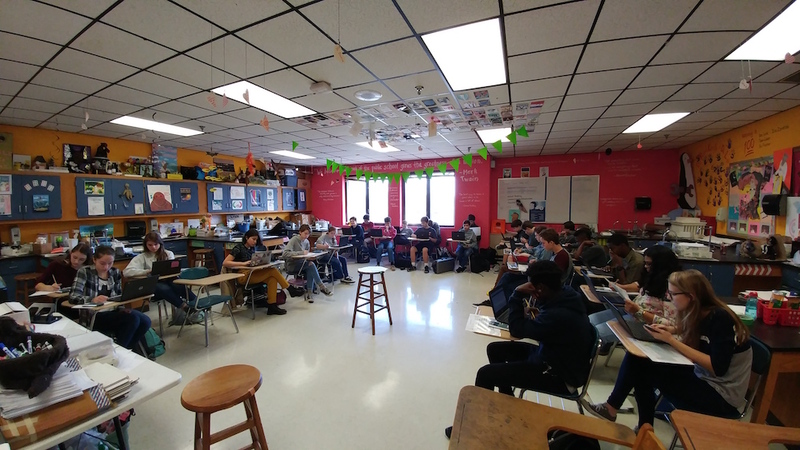 When Ashley Jessie arrived at West High School of Knoxville, Tennessee in the fall of 2016, she had a mission for the school: she wanted a way to bring the school closer together. In addition to boosting unity among teachers and students, as Principal of West High School she also had her eye on increasing student success on the state’s TNReady assessment. After a year of hard work by West teachers and students, Jessie’s mission for the school is becoming a reality. The school was named a Level 5 school due to the incredible student growth that occurred on the annual TNReady state assessments. Level 5, the highest achievable recognition, means that the school’s students made significantly more progress than the Growth Standard set by the state. (Level 3 would mean that the school simply met the Growth Standard) With the help of Edulastic and the unified efforts of teachers and students alike, West was committed to improving educational growth and earned this incredible recognition for their high level of achievement. 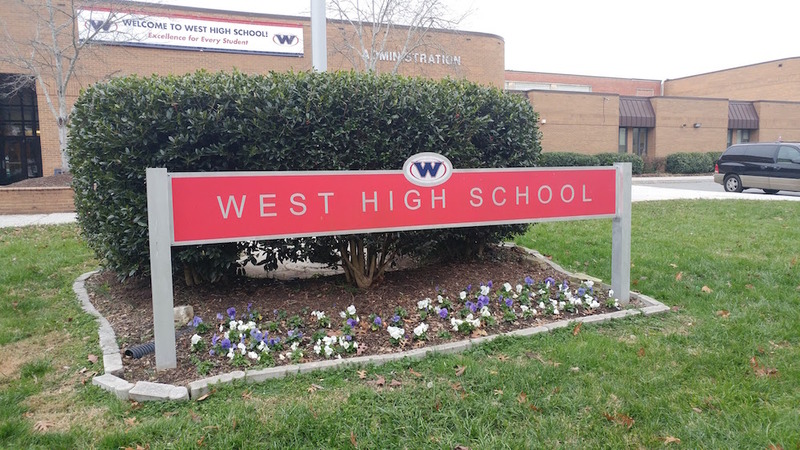 West HS had not been using a unified way to track assessment before Jessie arrived. Having had a positive relationship with Edulastic in the past, she decided to bring it onto the scene at West HS. “I decided to go with Edulastic because I felt comfortable with it.” she recalls. “What I did realize quickly was that we didn’t have all the standards for high school on Edulastic,” said Jessie. The remedy was simple — working with the support team at Edulastic, they were able to have all the necessary standards uploaded and ready to go. Students in Chemistry Teacher Lindsay Bell’s class work diligently on their Edulastic digital assessments. 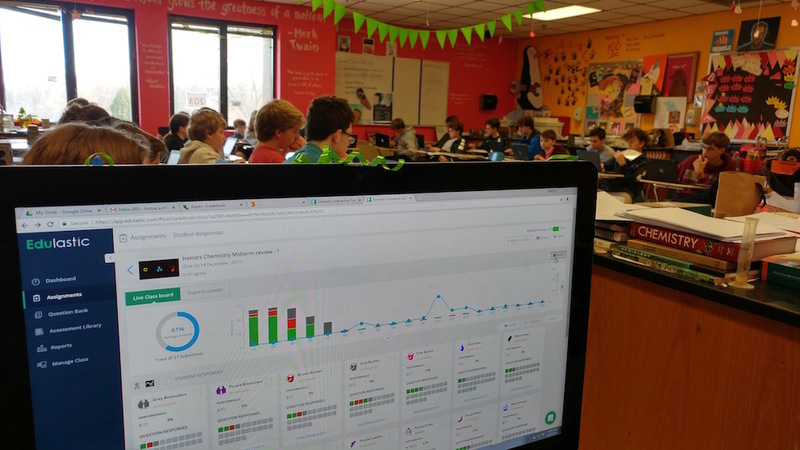 As students work through the problems, the results are updated in live time on her dashboard. 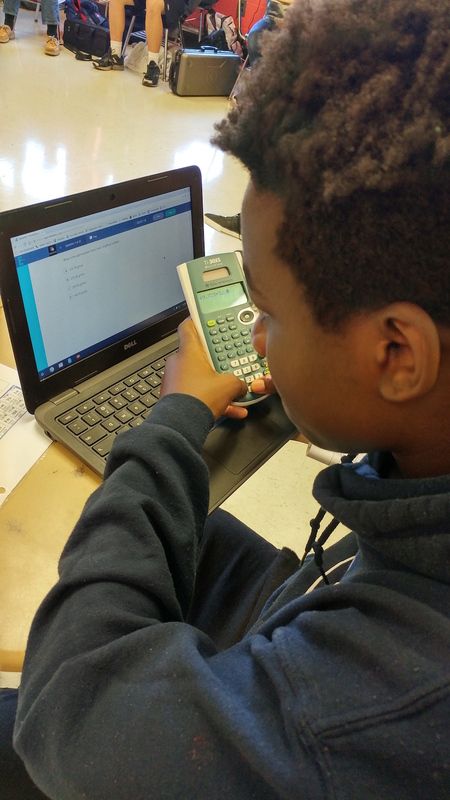 A student in Lindsey Bell’s class uses a calculator to work through the chemistry problems on his Edulastic formative assessment. The transition to Edulastic for digital assessment contributed to West’s theme of unity. 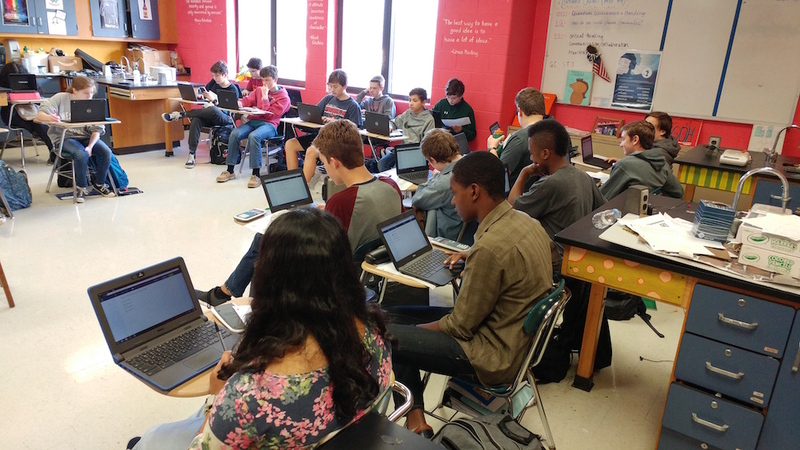 Whereas before teachers were working with pencil and paper or doing their own thing, common digital assessment allows teachers across grades or subjects to come together. By sharing an assessment platform they can easily collaborate, ascertain best teaching tactics, and work together to identify when to intervene and how to support struggling students. Edulastic provided a common language to support the common goals shared within each PLC. Nat Scott teaches English to freshmen at West and appreciates how digital assessment provides him visibility, which gives him peace of mind. Teachers can gather in their PLCs and have a better idea of where everyone is at. “Teachers get to work together. [Digital assessment] gets us on the same page. There’s more collaboration instead of trying to go your own way sometimes and knowing that you are working towards this common goal helps.” Scott notes. On the school leadership level, the reporting features in Edulastic allow Jessie to look at the progress of students across the school. From Edulastic’s reporting features she can see who needs more support and provide appropriate assistance to those teachers or students. Unified benchmark assessments tied to TNReady standards give insight into students’ progress toward mastering standards. 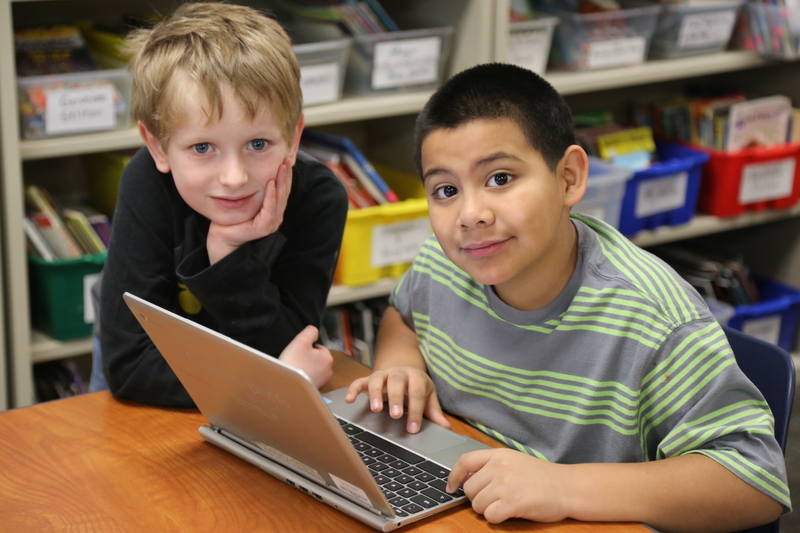 With online benchmark testing, students will be comfortable taking the online state test and the results won’t be a surprise. After one year, in the spring of 2017, West saw fantastic TNReady results and was honored by the Tennessee Department of Education as a Level 5 School, the highest attainable level. In Math and ELA, an incredible 14.3% of students who were struggling in the Below Basic category, advanced levels into higher brackets. The fantastic outcome came from the joint effort of the teachers and leadership at West. Edulastic served as a tool in their toolbox, providing the visibility and rigor needed to effectively prepare students. Moving forward, Jessie wants to continue to make the experience with Edulastic seamless for everyone. Jessie describes her relationship with Edulastic as more of a “partnership” because of the strong relationship and consistent dialogue between her and the product team at Edulastic. Since the beginning, the relationship has paved the way for updates and features that have helped make Edulastic assessments and reports even better for her and her teachers. She even includes a feedback section in her newsletter to the school that asks for feedback so she can pass along important suggestions or ideas to Edulastic. If you enjoyed this story, we have more for you! 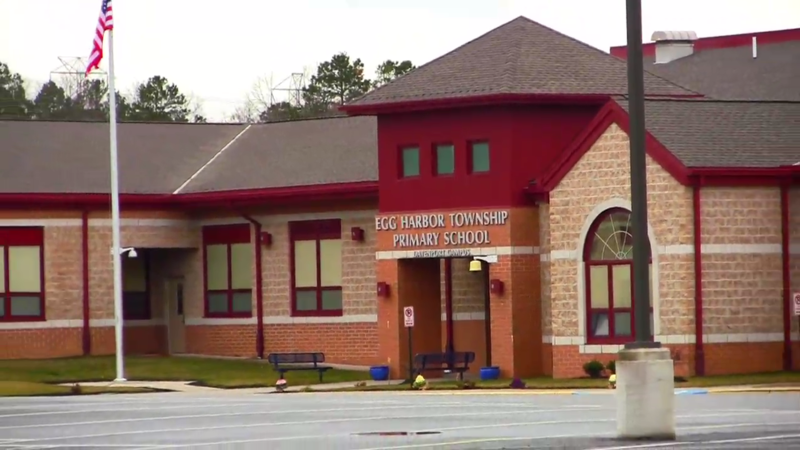 Check out how these other schools and districts are putting digital assessment to work and seeing great results.